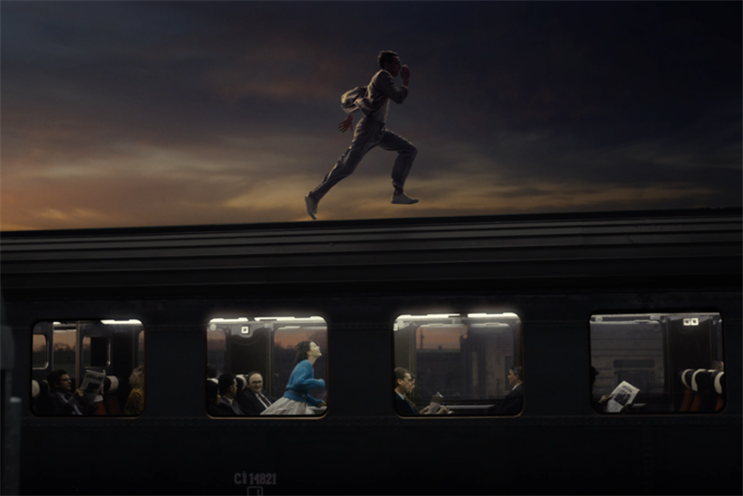 BETC Paris follows up 2014's "The Big Leap" with another epic journey that occurs in the blink of an eye. Tennis great René Lacoste created the polo shirt in 1933, but the clothing company he founded didn’t release its first TV spot until 2014. "The Big Leap," a superbly shot romance that compared a first kiss to plunging from a skyscraper, introduced the polo shirt purveyor’s latest tagline, "Life Is a Beautiful Sport." Lacoste, now a fashion powerhouse with retail locations in 110 countries and worldwide sales of $2.15 billion, is rolling out the next phase of its branding effort, with an emphasis on the history of the 84-year-old shirt with the green crocodile logo. "Timeless," a short film from BETC Paris that spearheads the campaign, follows a lovestruck couple through the years, all in the space of a single train trip. The agency set out to create "a fantastical metaphor of what makes life beautiful. What better than a first kiss or love at first sight to embody all the emotional power of Lacoste’s tagline?" Rémi Babinet, global chief creative officer at Havas Worldwide and founder and chairman of BETC Paris told Campaign US. "There is always a notion of urgency that comes from the sporty origin of the brand. It’s less about the functional benefit of clothing—even if as a brand inspired by tennis, the freedom of movement is key." The couple literally runs into each other in a Paris train station in the 1930s. From there, each scene recalls a decade from Lacoste’s history. The first train car features nurses and soldiers from the 1940s, followed by the stately elegance of the 1950s and the raucous crowds of the 1960s. The train becomes a subway car. The couple awakes and steps out into the present day. As with "The Big Leap," the technical challenges presented the biggest obstacle to the creative team. Each scene was shot on actual trains that dated from the respective decade, located at the Magyar Vasúttörténeti Park, a railway museum in Budapest. Few special effects were added in post, though "obviously the jump of the hero on the roof of the train was shot in studio!" Babinet admitted. The protagonists and 250 extras were dressed in period attire recreated by Oscar-nominated costume designer Madeline Fontaine, who crafted the outfits in "Jackie." "We wanted to represent each decade with symbolic, historical, cinematographic references or stylistic winks to those particular periods of time in France," Babinet said. "Our heroine looks like Anne Wiazemsky in Jean-Luc Godard’s movie ‘La Chinoise,’ or in the ‘80s like Isabelle Adjani in her loose and sensual jumper." The success of "The Big Leap," which racked up more than 60 million views online, placed pressure on BETC to create something equally successful. At the same time, neither Lacoste nor the agency wanted to retread old ground. "Lacoste did not necessarily want something similar, but another powerful and emotional film to keep building its premium image," Babinet said. But the agency did bring back director Seb Edwards and director of photography Hoyte Van Hoytema from the previous spot. BETC also plays with time in both spots, expanding a single moment or condensing 80 years into a single film. "Timeless" will run in cinemas and TV placements worldwide. In addition, Lacoste has released a new clothing line and introduced a new brand ambassador, Serbian tennis star Novak Djokovic, currently ranked No. 2 in the world. Timed with the beginning of the French Open last week, Lacoste presented a "changeover" from founder Lacoste to Djokovic, according to a statement from the company. The court-installed images combine photos of both men into a single frame. A print campaign shot by London-based photographer Jacob Sutton is out now. BETC Paris also created a 30-second black-and-white film featuring the creation of the polo shirt, the apocryphal story of Lacoste tearing the arms off his long-sleeved tennis shirt to improve his freedom of movement. The film juxtaposes Lacoste and Djokovic on the court and ends with Djokovic declaring himself "the new Crocodile," the nickname the press gave to Lacoste in his day.